“What should I do first?” Anne, my Turkish mother-in-law, asks rhetorically as I wash the breakfast dishes. The morning meal is barely finished, but she’s already preparing for this afternoon’s event. As I work at the sink, my mind is back in my own kitchen in Çanakkale, in northwestern Turkey, watching the tankers moving up and down the Dardanelles. My husband, Özcan, and I moved there for his university job after meeting in the United States during our postgraduate studies. Far from both our families, we live a quiet life, with frequent trips to Ankara, Ireland and here, the Black Sea region. In Çanakkale, I cook in Turkish style for the most part, learned by observing others and by trial and error in the safety of my own kitchen. I am a homemaker for the first time in my life. Burcu’s village - nestled in the hazelnut gardens of rising mountains, with a view of the Black Sea coast - is also the location of the Yiğit family farm and previous headquarters. The rough edges of the steep slopes, softened by brambles and ferns clambering over every surface, remind me of Ireland though home never seemed so lush or wild. We had been visiting Özcan’s parents for three weeks, long enough for the novelty of our visit to have worn off. We are incorporated in the family routine. I help with the housework while Özcan works in the family owned market on the ground level of their five-story apartment building. Anne’s kitchen is on the fourth floor. Anne rises to get the olive oil and asks me to bring an egg from the fridge. Crouching beside the bowl, she mixes with her hand, squeezing the meaty pulp through her fingers. Dealing with an expanding family and looking after her husband’s aging parents could not have been easy, but only in the past few years has any gray appeared in the sixty-one-year-old woman’s dark hair. Stuffing the grape leaves with Sadiye and Gulsah is a slow job for a beginner. I copy them inexpertly, placing the leaf across my palm, removing the stalk, adding the rice filling and rolling the sarma. I roll too loose or too tight, too long or too short, and everyone laughs at the worst ones. I laugh too as Sadiye re-rolls one of my failed attempts. The slimy leaves are gossamer thin and they tear easily. Slowly I begin to get the knack, feeling a sense of achievement as I speed up a little. I put the pot of sarma on the stove and go sit on the couch under the window, the July heat stifling. Sinking a little under the crowd, allowing the conversation to flow over my head, I watch the family work. Sadiye chops the onions as Arzu cleans the table and Saniye puts a pot of water on the stove. The comfortable gelin, Arzu is weaving a dance between the two sisters and Anne, respectfully allowing them to take the lead yet knowing exactly what to do herself. Discovering sugar is low, Arzu phones the market, and Gülşah dangles a woven shopping bag on a string out the window. So when will the wedding be?” Saniye asks Anne as she stirs the sugar syrup bubbling on the stove. The syrup will be poured over the dry burma boreği, fine layers of nuts and wafer-thin pastry rolled around an oklava, a narrow rolling pin. The pastry is then pushed together and eased off the oklava to form a wrinkled, hollow roll and then is chopped into finger-length segments. We have to meet the girl first!” her elder sister Sadiye laughs, though everyone knows that the conclusion is foregone - the engagement will be soon. “I think they should have it after the harvest but before the schools start.” Saniye makes the plan, surprising me with its haste; the hazelnut harvest will be over by the end of August. In Ireland, planning a wedding usually takes a year at least. Anne looks up from checking the pots, filling the room with the steam and the smell of cooking sarma. “We have to move downstairs first, and before that, the floors need to be sanded and polished. Sitting at the table again, I peel cucumbers, fresh from the farm, for the salad; Arzu chops tomatoes and onions. On my first visit, I had been the guest, waited on and treated with astonishing generosity. Now I am one of the family, included without special treatment. I try some nearly cooked sarma, soft and juicy, the leaves melt in my mouth with an explosion of taste. Anne tries to get Doğukan to eat some, but he refuses, running for cover again. “That child doesn’t eat, he is so thin.” Anne looks concerned. “Mine were all big children, like this..” She puffs out her cheeks in a comic imitation of her children’s chubby cheeks. Salad made, I survey the food: stuffed vine leaves, steamed cabbage and rice, Turkish meatballs, fried potatoes, and Anne’s homemade yogurt, with pastries, baklava, and burma boreği for dessert. Anne’s butter and yogurt are always made from fresh milk. The smell of food is rich and warm, soothing. Saniye, standing beside me, claps her hand, as she makes a sudden realization. “There’s no soup! Anne, what are we going to make?” Anne suggests a packet of instant soup from the market, lamenting the lack of time and all the things she still needs to do before the guests arrive. “Never!” Saniye replies, not wanting to serve instant soup to such special visitors. “We’ll make şehriye soup,” she suggests, referring to the orzo pasta cooked in a watery broth of tomatoes, onions and parsley. But Anne fusses unwilling to leave us to finish cooking while she changes her clothes before the company arrives. “ Anne,” I raise my voice to be heard, taken aback by its loudness, thinking of the quiet kitchen in Dublin and a little surprised to find myself addressing everyone. “You are the manager of the food factory. You go and leave the workers to cook.” Anne laughs, echoing me as she leaves the room, “Manager of the food factory; exactly, exactly.” I smile, pleased that she has understood and taken my advice. Soon everyone has arrived, a total of twenty-seven people. Children run up and down the stairs of the apartment and the market, escaping from the elders, who chat together. Burcu sits alone on a couch in the living room, an island in the midst of the sea of people around her, her tight head scarf adding severity to her rounded face. Her mouth is set and her eyes downcast; an air of sullenness barely disguises her nervousness. Hüseyin, the groom-to-be, walks in and moves through the people, kissing the hands of his elders, bending to touch his forehead to their hands as a mark of his respect. In this crowded, boisterous room, I have gained a family who accepts me as their own, without judgment. This family manages to accommodate the unconventional with the traditional - a feat in any culture. And finally I have accepted my place within the family too. Across from us on the couch is Burcu alone now, and once more looks bereft. I nudge Saniye, who squeezes my arm in agreement, and we join young Burcu on her coach, sitting down on either side of her. She brightens at the attention and we welcome her to our family. We thank Catherine Yiğit (the author of this essay and blogger for Skaian Gates) and Anastasia Ashman (http://about.me/anastasia.ashman), the editor of “Tales from the Expat Harem” (http://www.expatharem.com/) for their contribution and permission to use parts of this essay. This content like all other on our pages is under copyright protection. We welcome submissions and your comments on your personal experiences with tastes, cooking and culinary culture in Turkey. Send an e-mail to the Editor of Foods of Turkey, at editor@foodsofturkey.com and share your story with others. Cooking and eating as a family is a ritual in the daily life of Turkish families. Home cooking and eating as a family serve as the essential element for communications among the members of a family. Plans are made, hurt feelings are discussed and most importantly, family members express their interest and curiosity about each other’s lives over stuffed peppers. Preparing and serving food for extended families and friends are taken seriously and serve as indicators of respect and sincerity. The article below is an excerpt from the essay “The Food Factory” written by Catherine Yiğit, an expat originally from Ireland, a wife, and a daughter-in-law of a Turkish family. The story takes us through an event of family cooking. 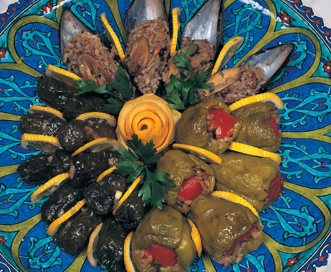 Our author gets to try her hand in Turkish cooking as she assists her family with the preparation of dinner including the international favorite, stuffed grape leaves. The family is preparing for a visit from the family of a potential daughter-in-law and a bride for their youngest son. The complete essay was previously published in the book “Tales from the Expat Harem: Foreign Women in Modern Turkey” (edited by Anastasia Ashman and Jennifer Gokmen, www.expatharem.com), a collection of many more delightful personal essays capturing Turkish living in the eyes of foreign women in Turkey. * Photo courtesy of Turkish Tourism Bureau.